Hot, spicy and tangy! This homemade hot sauce recipe is delicious. It can be used as a condiment, or to add kick to your next recipe. This is a fantastic use of garden peppers. 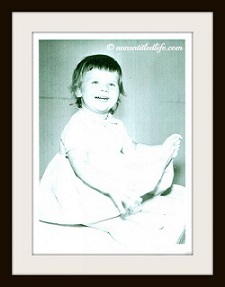 • Put on latex gloves (IMPORTANT! ), and open a window if you can. • Clean and core peppers. Note: leave some seeds. That is where the heat comes from. 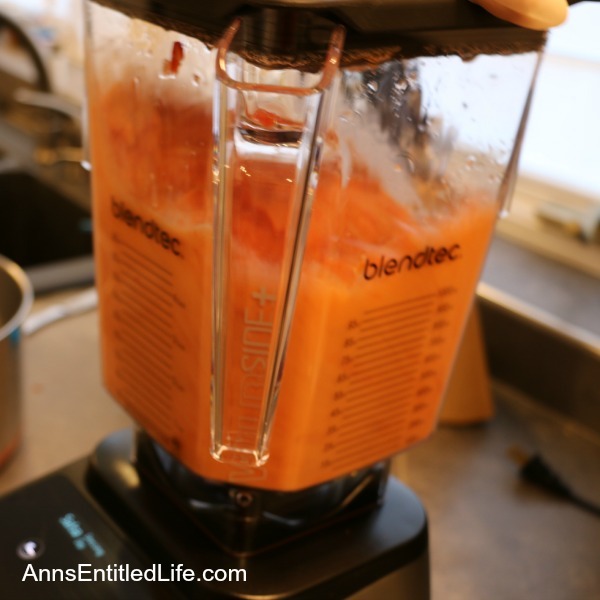 • Add all ingredients, except one cup of vinegar (hold back to rinse out blender after last blend) to a blender and process on high until smooth; you may need to do this in batches. After the last batch, pour that one cup of vinegar into the blender. This will allow the bits and pieces of pepper, onions and garlic left in the blender to dislodge. This also goes into the saucepan. • Pour resulting sauce to a large covered saucepan. 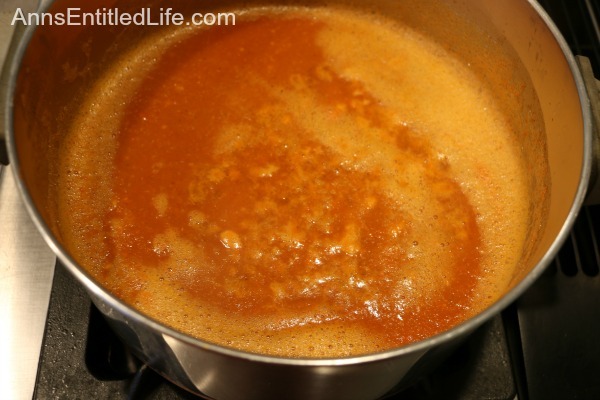 • Bring to a boil, and then reduce heat to a simmer. 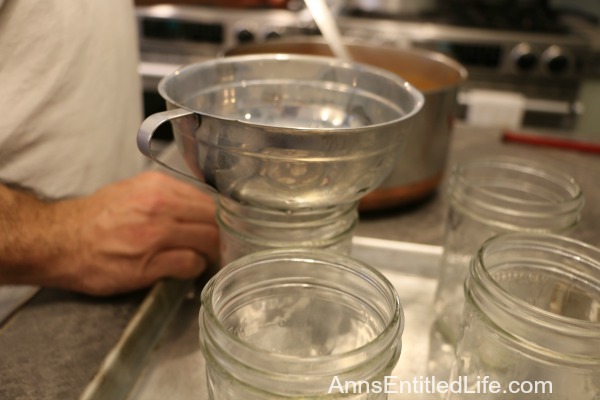 • While simmering, sterilize small glass canning jars, steel tongs, rings, lids and steel ladle in boiling water for 12 minutes, allow to cool, remove and dry. 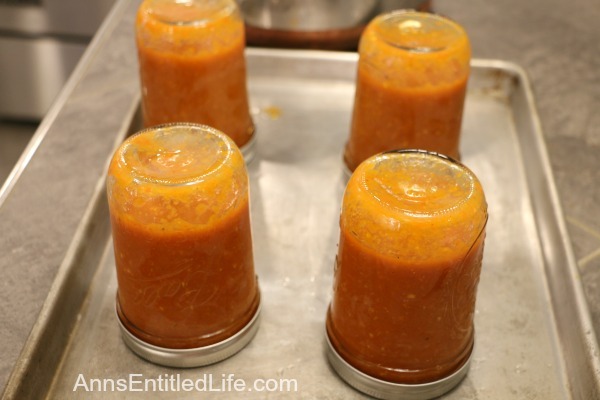 • When jars are dry and cool enough to handle, bring hot sauce back up to a boil. You want the hot sauce at boiling temperature when you transfer it. The liquid needs to be very hot to create the vacuum with your lid. 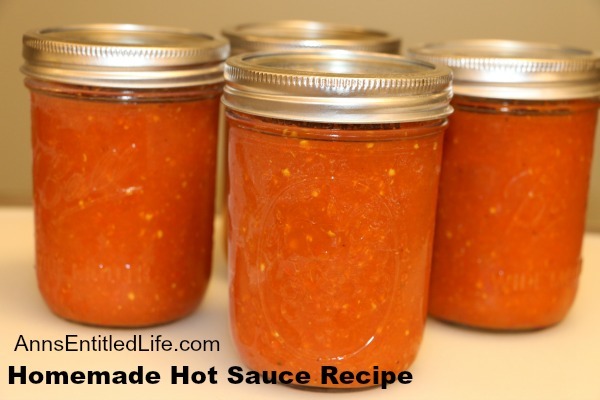 • Using a ladle, portion the hot sauce into the jars leaving 1/2″ head space. • Put lid on jar, place ring and tighten by hand. 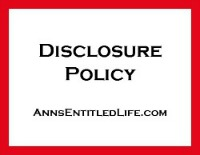 • Wrap jars in aluminum foil to keep out light. 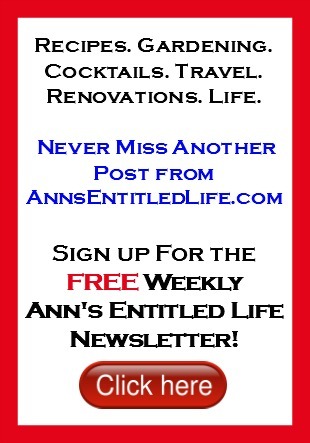 • Put filled hot sauce jars in the back of your refrigerator for a week prior to consuming. • Store in refrigerator at all times. 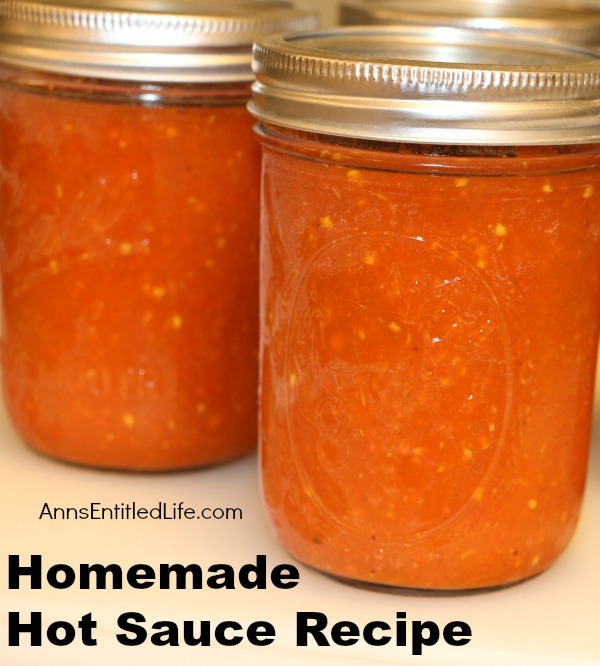 • To print the Homemade Hot Sauce Recipe, click here. We had a lot of hot peppers when hubby decided to make hot sauce. He did it a few times, and this is the recipe he made up. 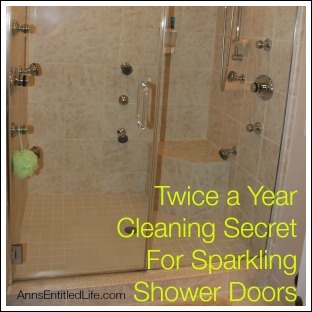 This had rave reviews! It is flavorful, and not just hot. To see how hot (or mild) your hot sauce will be, refer to the Scoville scale. 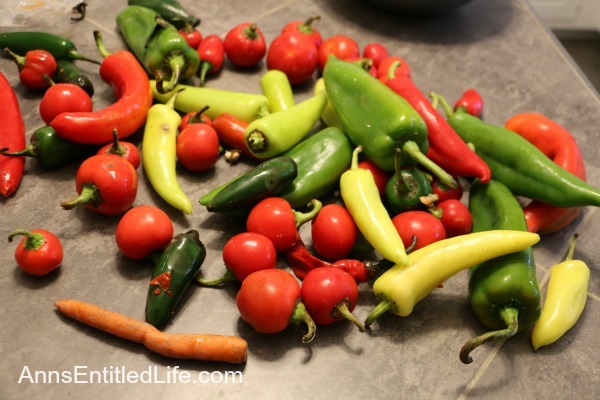 Mix and match your hot peppers for interesting flavors. • and process on high until smooth; you may need to do this in batches. 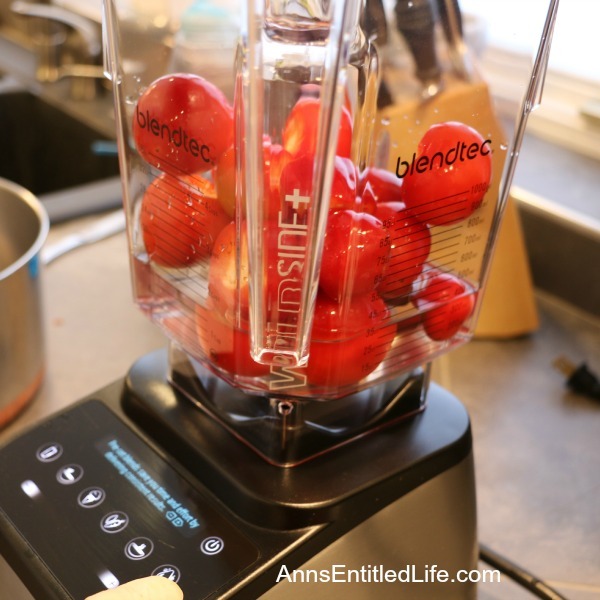 • After the last batch is processed, pour that one cup of vinegar into the blender. This will allow the bits and pieces of pepper, onions and garlic left in the blender to dislodge. This vinegar with the bits also goes into your saucepan. 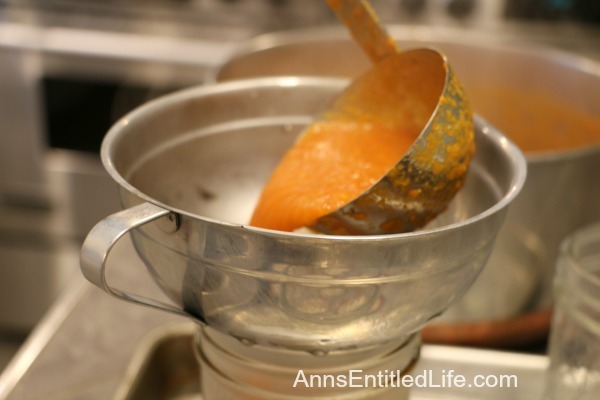 • While your hot sauce is simmering, sterilize small glass canning jars, steel tongs, rings, lids and steel ladle in boiling water for 12 minutes, allow to cool, remove and dry. • leaving 1/2″ head space. Hubby gave these away to a lot of people, and he was always asked for seconds a few weeks later. Leave the aluminum foil on the jars when you give them away, as well as in your refrigerator. Make sure those that you give your hot sauce to know to keep the aluminum foil on at all times! Hubby said light will make it go bad faster. Hubby does not think is acidic enough for shelf stable. He keeps it in the refrigerator just to be sure. Hello. I just bought a pressure canner and I’m new to using it. But if I followed directions for canning peppers in a pressure canner this would probably be shelf stable then, right? Hi Danielle, it very well should be! If it is canned in the canner or water bathed would it still be required to store in the refrigerator before opening. Don’t let those jars and tools cool down. 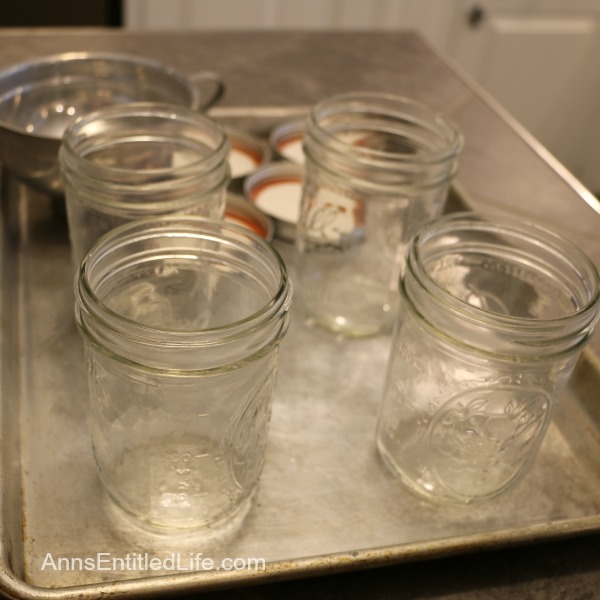 Use some sterilized tongs to handle the hot jars and lids. Put the boiling hot food into the jars and seal them immediately. Then give them a boiling bath. 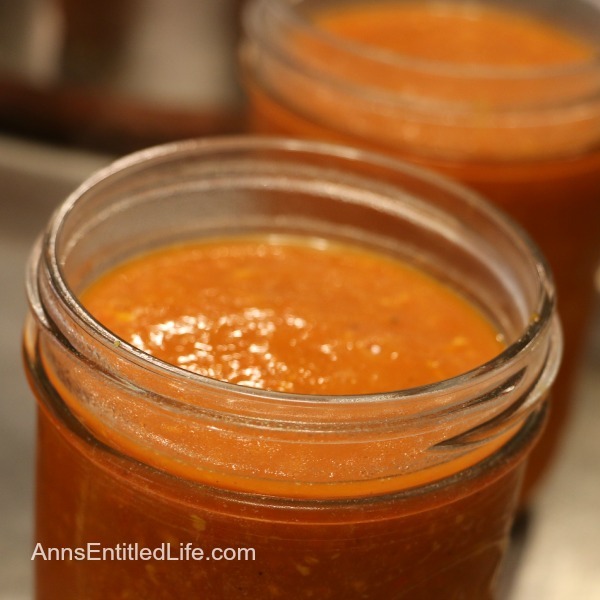 You can sterilizes the jars in the oven at 225 degrees for around 25 minutes. It is way easier. I have been doing it like this for years. Before you bathe them, let them cool. Then put them in a pot with warm water, then bring them up to boiling gradually. This way, the jars won’t break from the shock of being plunged into boiling water. Good luck. I make mine using jalapenos I grow myself. I chop up the jalapenos, a carrot, 1/2 of an onion boil in a little water. Blend smooth then put into jars and add warm vinegar, let it cool then cover and refrigerate. 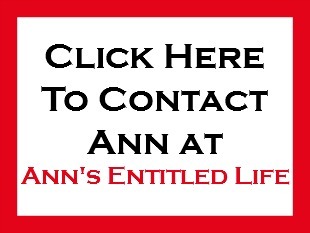 I only make one or two jars at a time so mine goes fast. If you have any kind of breathing problems I would not recommend you to make this recipe as the smell of the peppers can make it difficult for some people. I always open the kitchen window and the patio doors before I heat up the ingredients. I can’t wait to make this. My hubby loves hot sauce and we have TONS of tomatoes and peppers from our garden. Found you on Monday Funday. Great recipe! I made a sauce similar to this. 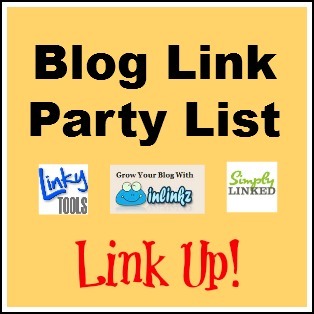 I’m pinning to try your recipe sometime. Looks amazingly good. Looks delicious. Will try it sometime. Thank you for sharing it with us. We would love to have you again next week. With all that vinegar, that is considered a pickled product. Therefore, water-bath canning is all you need to seal and preserve the hot sauce. No need to keep it in fridge, until after it is opened for use. It is very acid. Have him check the Ball Blue Book for times and quantities–best reference for canning, updated every year. The light is another story. I’ve seen commercial hot sauces’ color fade with time and light exposure. Foil or brown paper (even construction paper) will exclude light, preserving appearance. We will have to agree to disagree. I would never recommend this as shelf stable. I added about a quarter cup of honey to habenaros and ghost peppers for a slight sweet to the extreme heat! It is delicious! The recipe looks like it is a tomato salsa but I don’t see anything for how many tomatoes to use.